Ovation at Mountain Falls is bringing some luxury to the Nevada desert. After months of waiting since we first heard about it in April, Ovation at Mountain Falls is officially open and ready for sales. 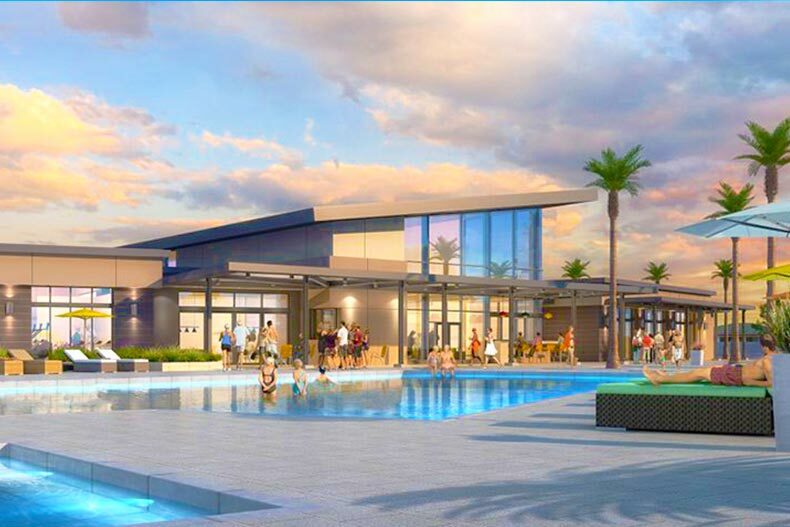 Located less than an hour from Las Vegas in Pahrump, Nevada, this 55+ community is part of the Mountain Falls master-planned community and filled with modern amenities and luxuries, not to mention a great variety of home designs. Homebuyers will be able to choose from nine different floor plans amongst the three single-family home design styles: The Onyx Collection, The Jade Collection, and the Topaz Collection. Each collection offers three distinct floor plans. The community calls for 601 homes in total and prices start in the Low $200s - Mid $300s. From 1,461 to 1,721 square feet. Includes two bedrooms, two to two-and-a-half bathrooms, and attached two-car garages. Optional features include multi-slide pocket doors to the patio and garage extensions. From 1,982 to 2,152 square feet. Includes two to four bedrooms, two-and-a-half bathrooms, and attached two car garages. Optional features include covered patios, hobby rooms, and pantries. Includes two to four bedrooms, two-and-a-half bathrooms, dens, and two to three-car garages. Optional features include extra space for bedrooms, bathtub features, and larger bathrooms. Amenity-wise, the central hub of the community is the recreation center. Inside, residents can find a fitness center full of cardio equipment. Also included inside are billiards tables and creativity rooms. Outside, residents can take full advantage of the beautiful Nevada weather and enjoy everything from the community pool to fire pits to BBQ grills. Residents can expect a number of outdoor parties and events throughout the year, which makes getting to know your fellow neighbors easy. Additionally, as part of the Mountain Falls master-planned community, there are a number of trails and parks scattered throughout the neighborhoods so residents will have no shortage of places to explore. Another highlight of the community is the Mountain Falls Golf Course, located right in the middle of the community. Golfers will have access to the course as well as a pro shop, a driving range, dining, and more. Throughout the year, golfers can participate in or watch golfing events and tournaments. Though there is plenty to like within the community itself, Ovation at Mountain Falls' great location provides plenty to see and do nearby as well. Less than an hour drive away is the Las Vegas Strip, which offers endless opportunities for shopping, dining, and entertainment. Residents will want to get to know Vegas the way other locals do. For those looking to embrace the outdoors, there's Mountain National Recreation Area and Death Valley National Park. Both provide miles of beautiful landscapes to explore and make for fun daytime excursions. Wine lovers will appreciate the easy access to Pahrump Valley Winery and Sanders Family Winery. And of course, there are plenty of casinos here in Pahrump as well as nearby in Las Vegas.